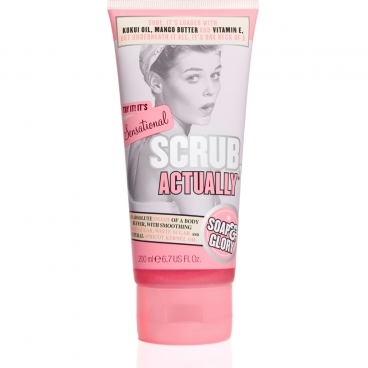 Like many, I'm a big fan of the wallet friendly Soap & Glory range of effective products so I was excited to try another of their body scrubs, Scrub Actually. Having bemoaned the fact that The Breakfast Scrub and Sugar Crush scrubs were both presented in tubs, I was pleased to see that Scrub Actually is presented in a handy tube. Matching the girly packaging, Scrub Actually is a pink coloured gel formula. The exfoliants are granules of brown and white sugar and although I generally find salt scrubs give a more satisfying exfoliation, you can really feel this working. The scent of Scrub Actually is described as fruity blueberry- to me, it smells like sweets, incredible! Despite being a gel formula, my skin didn't feel dry after using this and that's most likely due to the inclusion of apricot kernal oil, kukui oil, mango butter and vitamin E. I'd definitely recommend this if you're looking for a reasonably priced body scrub for regular use. I tend to get through quite a lot of this but at just £6.89 for 200ml, I don't feel guilty about doing so. I was on a hunt for some discount perfume online when I came across your page and I'm glad you featured that Scrub Actually because I've been longing to get that for years! I just couldn't find that in Walmart or Kohl's. Thank you so much!